Whether it's the thundering buffalo, the ancient Gods, or the fruit-filled jungle, some themes lend themselves perfectly to the top slots. The wide open spaces of Africa can be added to that list. With romantic notions of safaris, savannahs and endless sunsets, slots fans after a spot of elephant-spotting have been spoiled over the years. Leading land-based developer WMS Gaming - maker of a slew of well-regarded casino slots carrying the G+ technology - are the latest to get in on the safari tip with King of Africa. 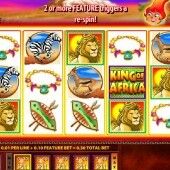 A 5 reel, 20 pay-line slot, King of Africa has a maximum jackpot of $15,000 (enough to send you on a little African jaunt yourself) and coin bets starting at just $0.01. Not only that, but the slot forms part of WMS's Hot Hot Penny portfolio (you'll see Penny herself sitting on top of the reels) and she will come into action later on in the game. As for images, it's what you'd expect from an African-themed slot: lions, impala, zebras, elephants, flame trees, Zulu shields and necklaces - yep, we're in Africa alright. The King of Africa logo acts as the game's Wild, and substitutes for all symbols other than the Flame Tree scatter. Get three or more of those Scatters across the reels and you'll trigger the Free Spins feature. Miss out on Scatters and only get two, however, and Hot Hot Penny will come to your rescue, re-spinning the reels for you. Eight free spins can be won initially, but it's the extra feature that makes this game, a 'pick the box' type game where you have to select 3-5 tiles, with each one revealing a different prize. Anything from one to 30 (yes, thirty) extra spins can be won if you hit gold coins. If that all sounds pretty exciting, there's even more excitement to be had during the freebies, as an extra Wild - the giraffe - is activated. He covers the entire reel, and for every subsequent spin will adorn a different reel. WMS don't really do full-on 3D, action-packed slots, but the slots they do do can include some pretty tasty bonuses. 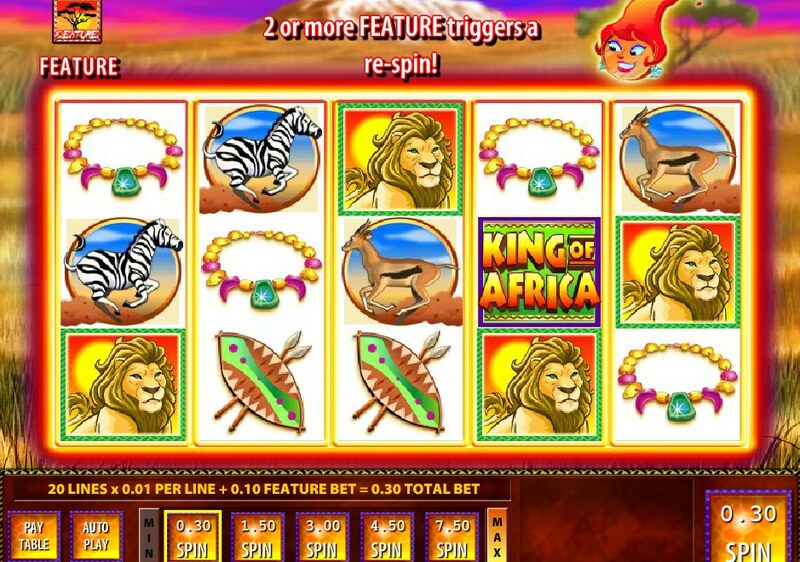 King of Africa certainly scores in that department, with the seemingly endless free spins bonus the main reason to head to this game. If it's put you in the mood to 'rein in Africa', make sure you check out Betsoft Gaming's 3D take on the African theme, Safari Sam, or the safari-based slot from Cryptologic, Savannah Sunrise, with its whopping $100,000 jackpot.